Among the greatest players in NBA history. 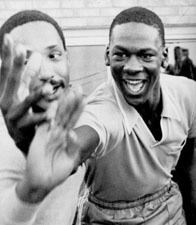 Led the Chicago Bulls to six championships, and also won an NCAA championship while playing at the University of North Carolina, and won Olympic Gold Medals with the American national basketball team in 1984 and 1992. Holds numerous NBA records, including highest career scoring average (30.1 points p/game), and led the NBA in scoring in ten separate seasons (another record). Since 2010, principal owner of the Charlotte Hornets (nee Charlotte Bobcats).